Going to Prague, I had been waiting for this day to come since I first picked up and read The Unbearable Lightness of Being by Milan Kundera in 1988. For some unknown reason, some of you might refer it to fate, that it took me 29 years to realise this dream. Kent and I left a hot and tropical short stay in Singapore for Prague with a transfer at Frankfurt Airport en-route. When we arrived 15 and a half hours later – on time at about 11PM; not even the tiredness of the long haul flight, or a central European chill in the temperature could dampen our excitement. However, as we waited and waited to collect our luggage – at an eventually empty baggage carousel, we realised that our luggage had not made it… Our bags, clothes and boots were still in Germany! Disappointed? Yes. Surprised? No, as we had just faced a very challenging transfer experience at Frankfurt Airport. Well we had only one and a half hours to change planes and we struggled… Passport control (we weren’t expecting that till Prague) had long queues, then another tight security check.., by the time we made it to the boarding gate, after an up-down around-and-around marathon run through the airport, we were two of the last four passengers; we had made it at last – Phew!!! But all was not over, we boarded not the plane but a bus! Then a ‘tour de airport’ ride of at least 15 minutes to our plane. ‘Would our luggage make it?’ I thought about it as we wound our way across one of the world’s busiest airports and seriously doubted it. Luggage disaster aside, after we organised with the helpful airport staff to have our bags sent on to the hotel; it was time to meet our limousine driver, but we were now 50 minuets late, would he still be waiting? As we walked out to the arrival lobby it was just past midnight, and there was only one soul standing (with my name on a sign) – our driver Jan who was pre-arranged by the hotel. ‘Ahoj’ called Kent and we both greeted him with our only Czech. Jan was a friendly young man who wasn’t at all stressed by our lost-luggage delay. So there we were, seeing Prague for the first time on a quiet night from the back seat of a black Mercedes, and Jan happily chatting with us and answering our questions in English. Open road gave way to modern structures, then picturesque curved narrow streets and much older architecture, street lamps adding a sense of enchantment to glimpses of Gothic towers, and the unusual rump-bumble of the car tyres as we drove over cobblestone roads of old Prague… I knew we were in a foreign land, but to me all this belonged to a different world – the world I had once read about in fairy tales. Our late check in at Alchymist Nosticova Palace went smoothly. Marek, the night porter took us to our room – Alžběta Pomořanská, which was on the top floor. As the three of us squeezed in a tiny lift, ‘Sorry about our small elevator, it’s a heritage building and we have strict rules regarding interior changes.’ Marek explained. We didn’t mind a small lift at all, however I did feel a bit ‘lost’ without our luggage, but at this point of time, we were tired and would leave the worries to tomorrow. Well I had mentioned it in a previous post that I’ve always been attracted to loft rooms, and this Deluxe Room we called home for five nights, not only was it a charming, elegant room which I fell in love with at first sight; it had a spacious corner bath bathroom which I absolutely adored. More details of our fabulous room will be revealed in my coming posts. This amazing red dawn shot was captured by Kent from our east facing bathroom window the morning after we arrived. 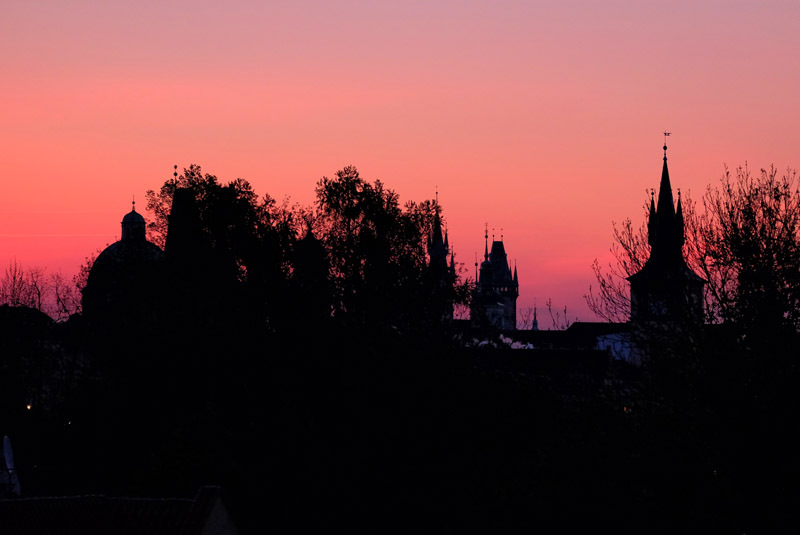 We felt privileged to see a red dawn like this; not once but twice during our five-night stay in Alžběta Pomořanská. A colourful dawn no doubt contributed to Kent’s decision to bare the cold (all our warm clothes were in our luggage) and take a morning stroll in our new locale even though it was -1 degree Celsius outside. Kent came back with frozen hands and cheeks and photos he took of ‘those crazy Europeans’ – two men skinny-dipping in the Vltava River. ‘In this sub zero of weather?! !’ Being a wimp when it comes to the cold myself, I simply shook my head. If you’d like to view this picture, check out Kent’s Flicker page here. 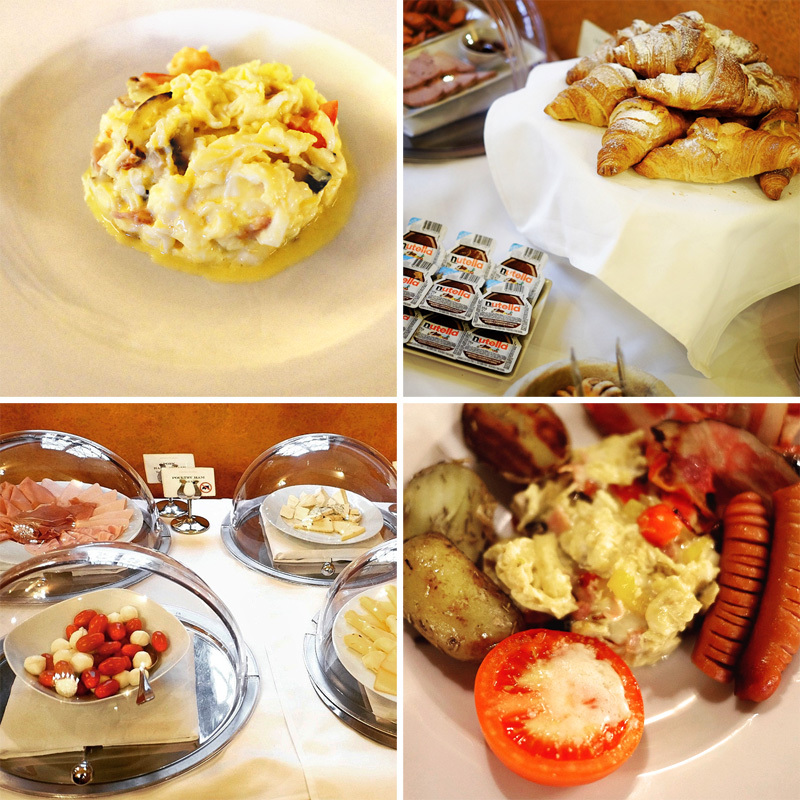 Fabulous buffet breakfast in the hotel restaurant San Carlo. Not only did we enjoy our breakfasts, we loved the décor of crystal chandeliers and classic painted Italian wall and ceiling details. Kent was quietly impressed by the coffee. He was happy to be greeted and promptly given our pot of black coffee and pot of warm milk (the way he liked it), which Kent considered to be of a high standard and more than enough cups to do the job! Charles Bridge, Here We Come! Since we were once again in possession of our jumpers, coats and scarves, it was time to explore Prague. 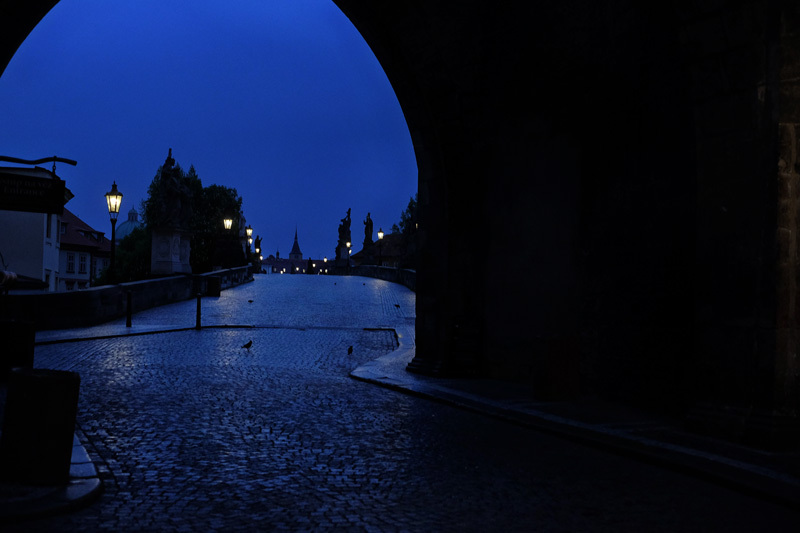 My foremost desired destination was, no doubt about it the famous Charles Bridge. And Kent, making an unusually romantic decision had avoided the Charles on his early morning walk so we could encounter it together. From our hotel to Charles Bridge was a short and pleasant walk, over the little Venice canal, on through Kampa Park skirting the Vltava River; and then, a small cobbled avenue lined with trees, up the old stone stairs to the bridge itself; with the Western tower above announcing the way, then the eastern tower saying ‘here is Prague’. The Charles Bridge was everything I had imagined it would be, and perhaps even more. 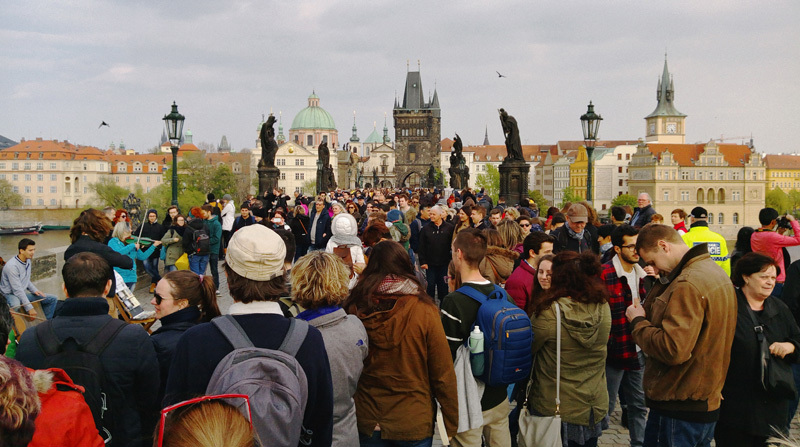 That we were sharing our first time on the bridge with hundreds of others did nothing to diminish the experience of its beauty and the grandeur of the towers and domes of Prague on the other side. We crossed over and walked on to the Old Town Square enchanted by the architecture: Romanesque, Gothic; Onion Dome, Renaissance; Baroque, Art Nouveau… What an historic display! No wonder people call Prague an open museum! Although we didn’t come to Prague for the Easter Markets, we just happened to be there during that festive period, and it turned out to be such a fun and enjoyable experience. 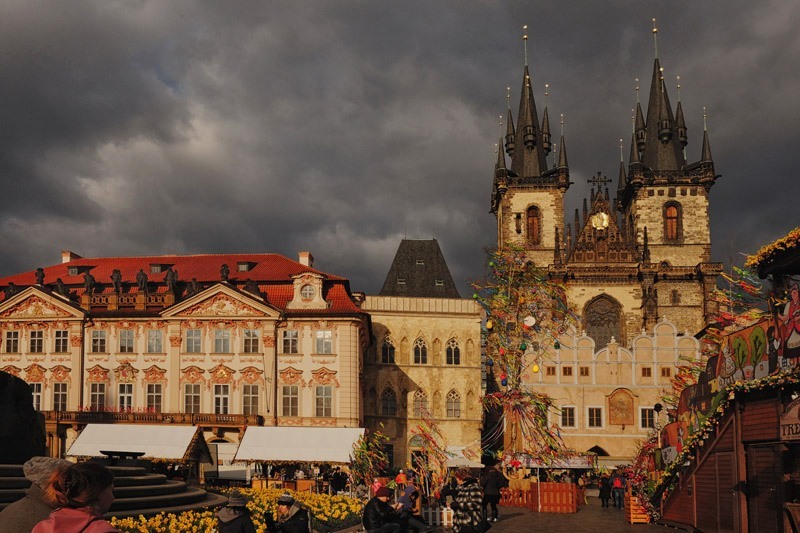 The main squares for the Prague Easter Markets were the Old Town Square, Wenceslas Square and the Square of the Republic. 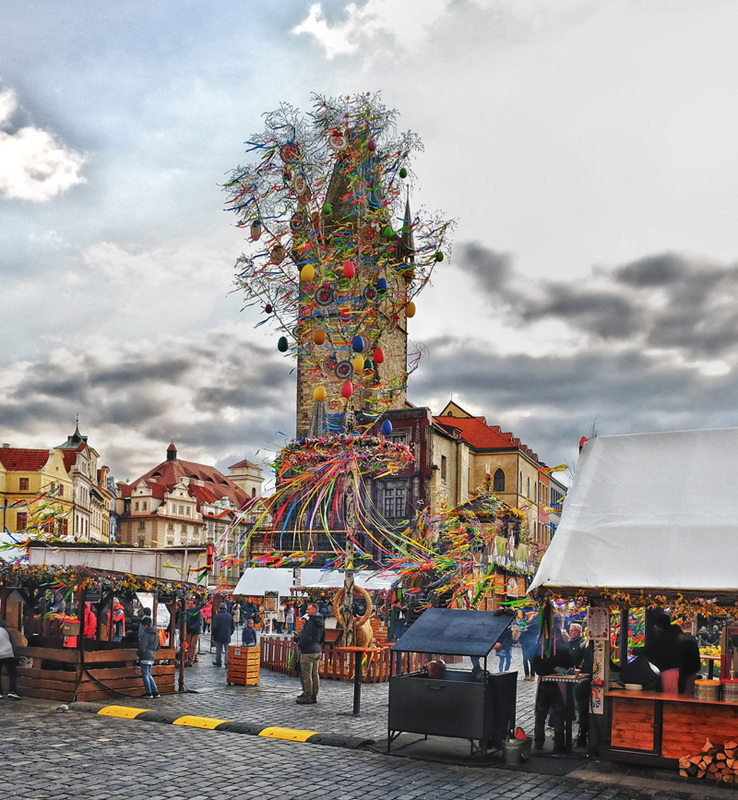 We joined the ebullient crowd in the Old Town Square which was filled with traditional olde worlde stalls decorated with folk motifs flowers and hand-painted Easter eggs, and a stage with a rainbow of colourful streamers. The whole square was full of shops, food and drink stalls; if you fancied even more old world charm, there were horse-drawn carriage rides for you to indulge in. Having admired the glassware, hand crafted goods; ceramics, puppets and dolls, we went for the local food and drinks. We picked a tall table on the edge of the square, Kent and I shared a plate of wood smoked pork – they cook it right there, the pork was smoky and very tasty! While Kent was enjoying his Czech beer, I had the richest hot chocolate EVER; a small warm cup of essentially, rich liquid dark chocolate. We ate, drank, watched the crowd and enjoyed ourselves; in fact, we enjoyed ourselves so much that we didn’t mind the chill of a European spring. If you are planing to visit Prague around spring time, do yourself a favour by booking within the Prague Easter Markets calendar. I highly recommend it. 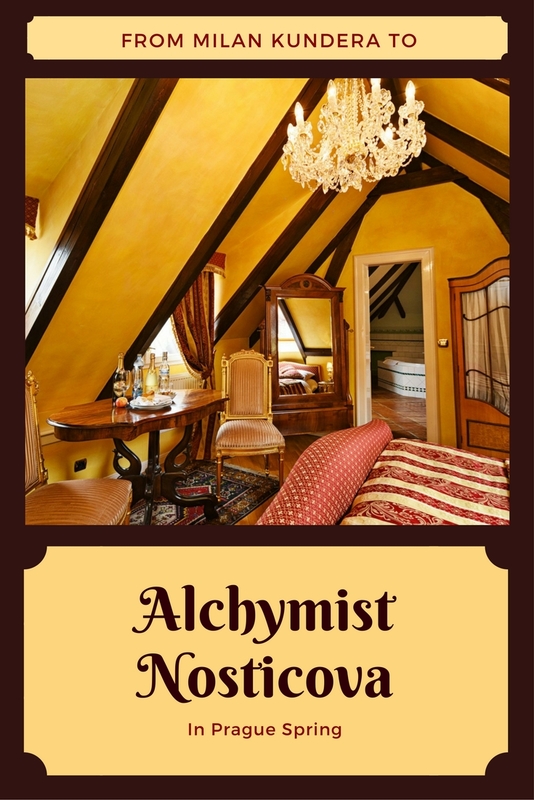 More of our Prague spring story and review of the Alchymist Nosticova Palace will be in my coming posts, so stay tuned! 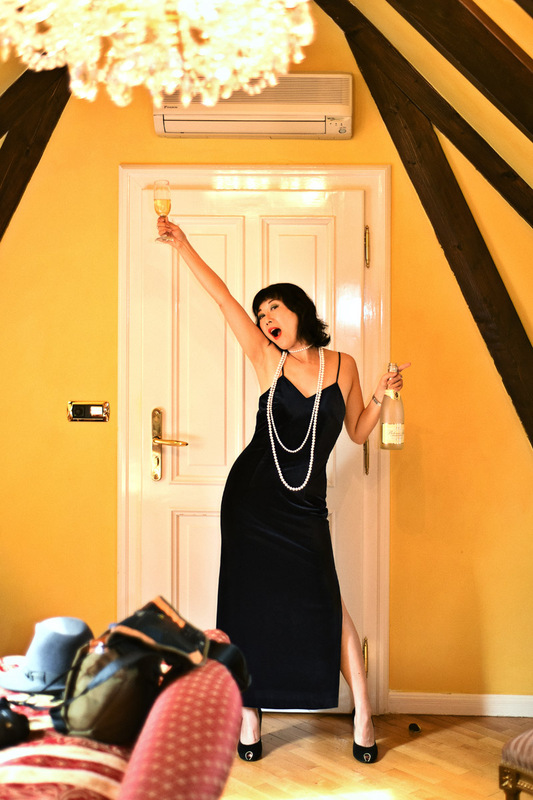 Hubby and I are visiting Prague in October this year and I CANNOT wait… Your post has added to all that excitement! Thank you so much for your wonderful compliments Ankita. 🙏 I’m excited for you and Karan regarding your Prague visit in October and I’m sure that you will fall in love with it too. 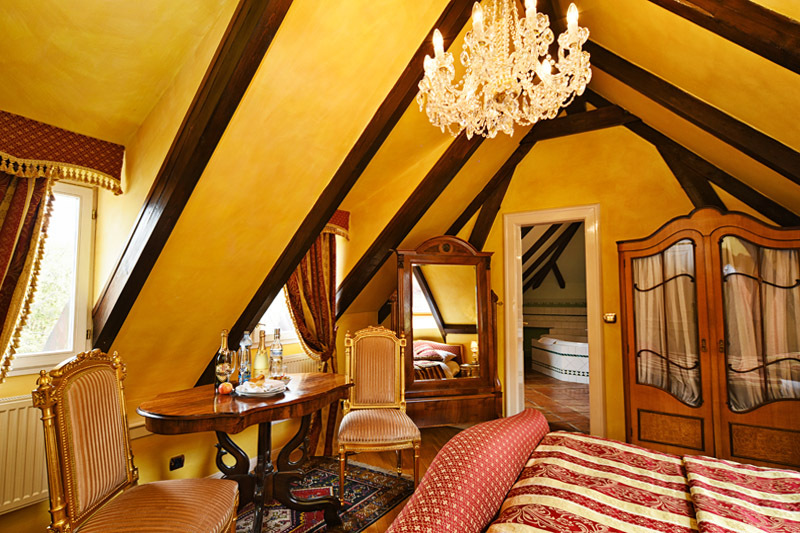 Hi Ankita, You will LOVE Prague; it’s just so beautiful and quite laid back. We had such a great time, certainly come through in the pictures! Thanks for your kind words. Viv is certainly great to have as a model/muse as well. 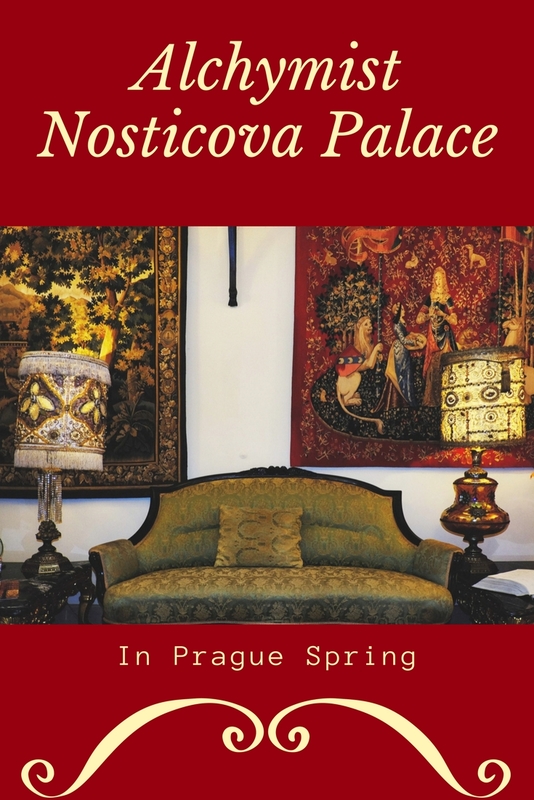 Love your review Vivienne you transported me from that empty luggage carousel into a world that highlighted the magic and fairy tale city of Prague. 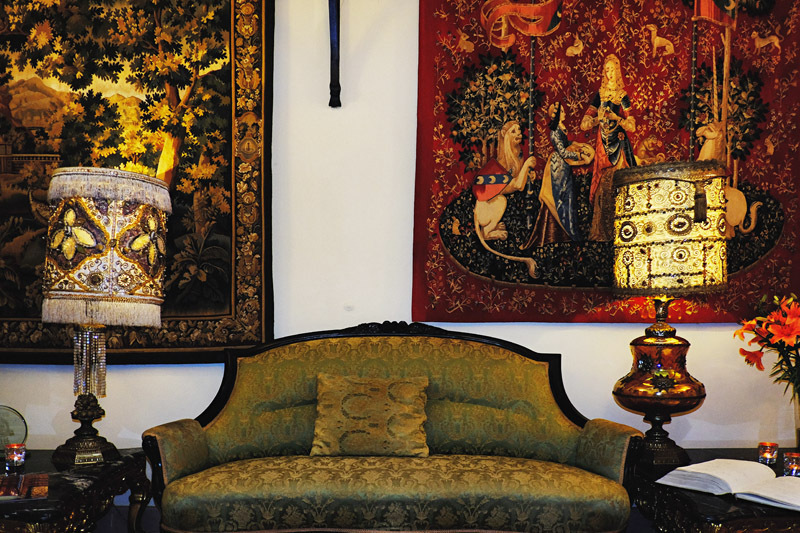 Thank you Kent for the superb photographs both interior and exterior shots they are full of colour and enchantment. Thank you for showing me through your pen and eyes Prague a city I will never get to visit in my lifetime. Thank you very much Max. Your kind words and great support mean a lot to me! I’m happy to hear that you enjoyed the ‘tour’ with us, and stay tuned as there are plenty more to come! Prague is a wonderful city. Kent is a great photographer.